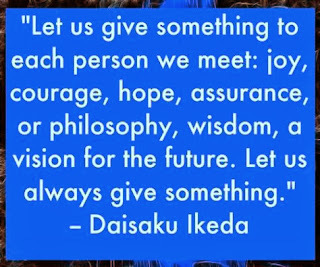 From the essay Buddhism is the Clear Mirror to Reflect Our Lives, in To My American Friends, by Daisaku Ikeda, Page 99. "When people worship the Gohonzon, all Buddhas and bodhisattvas in the entire universe immediately respond to their prayers by lending their protection. If they slander the Gohonzon the affect will be exactly the opposite. For this reason one's mind of faith is extremely important. The mind of faith has a subtle and far-reaching influence. There may be times, for instance, when you feel reluctant to do gongyo or take part in activities. That state of mind is precisely reflected on the entire universe, as if on the surface of a clear mirror. The heavenly deities will then also feel reluctant to play their part, and they will naturally fail to exert their full power of protection. On the other hand, when you joyfully do gongyo and carry out activities with the determination to accumulate more good fortune in your life. the heavenly deities will be delighted and will valiantly perform their duty. If you must take some action anyway, it is to your advantage that you do so spontaneously and with a feeling of joy. If you practice reluctantly with a sense that it's a waste of time, disbelief and complaints will erode your good fortune. If you continue to practice in this way, you will not experience remarkable benefits, and this will only serve to convince you that your practice is in vain. This is a vicious circle. If you practice while doubting the effects, you will get results that are, at best, unsatisfactory. This is the reflection of your own weak faith on the mirror of the cosmos. On the other hand, when you stand up with strong confidence, you will receive limitless blessings. While controlling your mind, which is at once extremely subtle and solemnly profound, you should elevate your faith with freshness and vigor. When you do so both your life and surroundings will open wide before you, and every action you take will become a source of benefit. Understanding the subtle workings of one's mind is the key to faith and to attaining Buddhahood in this lifetime. for Strengthening Your Mind of Faith. PowerPrayers are suggested ways to focus your mind while chanting. They are not to be chanted themselves. While chanting Nam-myoho-renge-kyo let your mind focus on some aspect of this PowerPrayer if you wish...for added strength and focus. If you like this PowerPrayer and want to share it, feel free to share it on Facebook or email a link using the links at the bottom. Thanks! I am determined to chant every morning and every evening no matter what. I no longer allow anything to stop me! I establish an unshakable practice at the core of my life. And I see the results immediately! and the rest of my life flows effortlessly! I love my life more and more. Every Nam-myoho-renge-kyo strengthens my life! With every Nam-myoho-renge-kyo I feel Buddhahood Rising! I am overflowing with wisdom, compassion and love for mySELF and others! Every day I see positive changes! I am determined to enjoy my time chanting and being with my fellow Gakkai members. I chant to bring my full self to every meeting, and to participate with joy. If there is something I don’t like about my meetings, I make a fresh determination to do my Human Revolution so I can cheerfully make a difference in my own district! I am deepening my understanding of what I study with every Daimoku I chant. My depth of understanding is growing! I read the Gosho and President Ikeda’s Guidance every day, and chant to understand it with my life! Whenever I study I see the inner working of my life, and my prayer becomes deeper, and deeper and deeper! It has been a busy last few days! Here's a picture from the 5K race Aaron ran yesterday. He came in second - Aaron is on the right. The whole town of Downers Grove, Illinois turns out for this. Over 6,200 people walked or ran. The money for registration in the race is collected in the name of a great teacher who died too soon, and it's distributed to selected High School Seniors in the form of $1,000 scholarship checks for college. 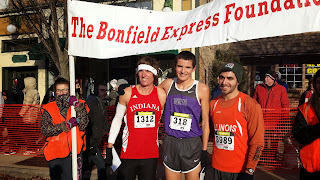 We have participated in this race since it began 10 years ago, and Aaron was a Bonfield scholarship recipient when he was a High School senior. In America the "Holiday Season" has officially begun. It is a time that starts around Thanksgiving and goes through the first of the year. For many of us the highlight is Christmas on December 25th. Even though it is a Christian holiday, many Americans celebrate culturally with Christmas trees, presents, and family get togethers. We also watch cherished Christmas movies and sing Christmas Carols. Many help the needy. It is a time of year that we can bear the cold, and twinkling lights are everywhere... wrapped around outdoor trees, and strung from buildings. I love being in the Midwest during this time of year. I lived in California for 15 years and returned home to the Midwest every Christmas season so we could experience a good snow...a warm fire...and that unmistakable holiday feeling. I am interested in holidays all over the world. Can you help me learn about your holidays? Diwali recently happened and I wasn't prepared for it at all! I would love to celebrate alongside all my friends in the world, (YOU!) and I need some advance notice, some education about the holiday, and some holiday preparation. By the time Diwali came it was too late for me to find specialty stores and get lanterns! If you want to send me holiday traditions from your country I would love that! I love real mail and packages! I want to celebrate with you. Several years ago I became a celebrant so I could learn how to perform weddings, funerals and celebrations of all sorts. I believe it is important for us to take time to honor important moments! So I am writing this to say that I haven't written a blog post in two days because I've been so busy shopping, cooking and hanging out with my two boys, Aaron and Ben. Aaron is, as many of you know, in his second year of Medical School at Loyola Stritch School of Medicine, about 20 minutes from me. Long time readers of this blog know that his choice of school is an example of real Buddhist FORTUNE in my life, and his. Of ALL the medical schools all over the country he chose the closest school to me, and it has been perfect for him. THAT is fortune. Money cannot buy that! As you can imagine, he's a busy guy, so when he is available I spring into action! Ben lives back at home for a while and we get to see each other more often. It's so great having him close! I have soooo much fortune in my life! So.....Aaron, Ben and I spent Wednesday at the Mall shopping for blue jeans for them. What else? So much fun! And yesterday was a holiday called Thanksgiving in America. Thanksgiving is a time to cook traditional foods, turkey, stuffing, gravy, mashed potatoes and pies. Most people go into a bit of a sleepy stupor after the meal...happily! For some families watching American football is a tradition. Others may play games. And yesterday, Jewish families they got to celebrate Hannakuh and Thanksgiving at the same time. I have been smiling and laughing for two days straight! I am so grateful for this practice for keeping me in such a high life condition. Some people get sad around the holidays, whistfully thinking about holidays past when all their loved ones were alive. Keeping a high life-condition allows me to lovingly remember them, but still be happy. Aaron and Ben are here this morning. Aaron is studying, and Ben will awaken shortly and I will make a special breakfast of French Toast. I dip thick bread into a mixture of eggs, vanilla and cinnamon, heat some real butter, brown it on both sides, and they eat it with maple syrup on top. Okay that's enough food for now. Thanks for writing me to wonder if I'm okay! 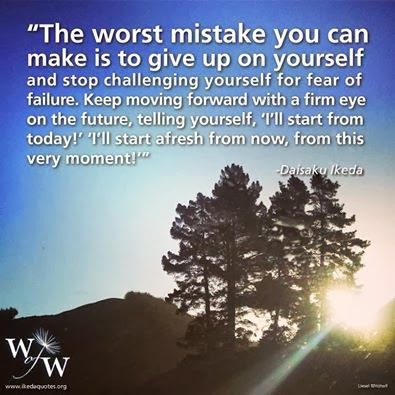 Many of us have read Daisaku Ikeda's essay "Buddhism is the Clear Mirror that Reflects our Lives." Here is the link to the "Clear Mirror Guidance" that asserts "The Gohonzon (scroll we face while chanting) is the clearest of all mirrors that reflects the entire universe exactly as it is. When you chant to the Gohonzon, you can perceive the true aspect of your life and tap the inexhaustible life force of Buddhahood." I've been doing some soul-searching lately. Maybe you have too. November 18th has come and gone. We have achieved some of our goals, and some of them we are still working on. We know that we have to maintain hope and we know we will succeed, and we turn to the words of Daisaku Ikeda and Nichiren Daishonin for encouragement. It is a great time for some self-reflection. We know that change in our environment and achieving our goals comes from Human Revolution ~ inner change in the core of our lives triggering corresponding change in our environment. We know this intellectually, but how can we deepen our understanding and leveraging of this great truth? Sensei has said that our ability to bring our own wisdom to the surface through chanting is the key. How can we expand our ability to do exactly that? 1. Life! Illuminate what I need to change...what I need to see and how I can improve. 2. Life! What can I reveal to myself about the inner workings of my mind, my life, my actions and words that will free me from the blocks that still exist for me? 3. Life! What actions do I need to take so that I can affect real, lasting, positive change in my life? See what these questions reveal for you. This kind of inquiry takes concentration and courage. I get many emails from readers who are living in situations where they have difficulty expressing themselves and are experiencing hopelessness. My goal is to explore and challenge true and respectful expression in my own life, so that I can deepen my wisdom to help others. I am dialoguing in prayer. For today, I slowed the speed of my Daimoku. I put my phone in the other room for this hour of chanting Nam-myoho-renge-kyo. Putting the phone away is key...the world is always calling isn't it? Emails...texting...calls...it goes on and on. As Buddhas we must be able to put the world aside and focus, and that, for some of us, involves putting the phone in another room. "One of the important Buddhist concepts, dependent origination holds that all beings and phenomena exist or occur in relation to other beings or phenomena. All things are linked in an intricate web of causation and connection, and nothing, whether in the realm of human affairs or natural phenomenon, can exist or occur solely of its own accord. ...Our society today urgently needs the kind of inwardly directed spirituality to strengthen self-control and restraint. It is a quality that deepens our respect for the dignity of life. In a world where interpersonal relationships are becoming increasingly tenuous, greater self-control and discipline would also help restore and rejuvenate endangered feelings, including friendship, trust, and love, for without them there can be no meaningful bonds between people." We have the capacity to use our Buddhist practice to gain self-control, express ourselves clearly, with composure, forethought, and mutual respect to strengthen our relationships, and build our environments into worlds of absolute happiness and fulfillment. This is a worthwhile endeavor, don't you think? "Why is it that sometimes our prayer seems not to be answered? This is a manifestation of the Buddha's wisdom - so that we can deepen our prayers, become stronger people, live more profound lives and secure deeper, more lasting good fortune. If our slightest prayer were answered immediately, we'd become lazy and degenerate. And we couldn't hope to build a life of great dignity and substance." Page 89. "There may be times when life seems gloomy and dull. When we feel stuck in some situation or other, when we are negative toward everything, when we feel lost and bewildered, not sure which way to turn ~ at such times we must transform our passive mind-set and determine "I will proceed along this path," "I will pursue my mission today." When we do so a genuine springtime arrives in our hearts, and flowers start to blossom." "Viewing events and situations in a positive light is important. The strength, wisdom and cheerfulness that accompany such an attitude lead to happiness. To regard everything in a positive light or with a spirit of goodwill, however, does not mean being foolishly gullible and allowing people to take advantage of our good nature. It means having the wisdom and perception to actually move things in a positive direction by seeing things in their best light, while all the time keeping our eyes firmly focused on reality." As always, thank you so much for passing along the url to this blog to others, and for sending me your comments, questions and victories at chantforhappiness@gmail.com. I answer every email. The great Buddha is now reading this blog - YOU! Did you read the long essay from Dr. Obo I posted a few days ago? It suggested to think to yourself "The Great Buddha just drank her coffee"...or "The Great Buddha just wrote an email"...you get the picture ~ you are the Great Buddha as you are going about your day. You are the Great Buddha, we are all the Great Buddha. Try this if you want. And let me know what you think. It is simple after all. This practice just makes so much sense. We chant the name of the rhythm of life itself..."Nam-myoho-renge-kyo" (meaning "I fuse (devote) my life to the Mystic Law of Cause and Effect through sound vibration, or teaching) while we infuse our thoughts with our prayers for our lives and the lives of others...for the happiness of all living beings. Nam-myoho-renge-kyo is a law. It doesn't matter if we believe it will work or not. It is the law of cause and effect. We ARE Buddhas; we are absolutely Buddhas...we are awakened ones to the law of the universe. We are the mocrocosm of the universe. We know this. But how do we live this? In America we have our study exam coming up. Studying is exactly what we need to "hone our saw" to get more benefits. Our understanding of this Buddhism helps us create real results when we chant. We call this Practical Buddhism because we see results in our lives. And the more we study, the more we see results. That's just the way it works! I wholeheartedly encourage you to take the test, and study for it with others even if you've already taken it. Today the Great Buddha is watching it snow here in Chicago. We are having a deep freeze. A "cold front" as they call it. 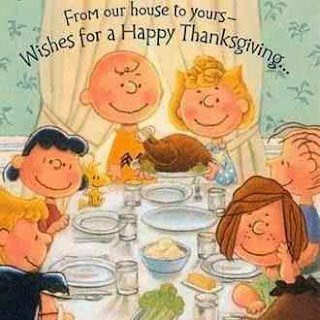 It is the Monday before our national holiday called Thanksgiving where most people eat Turkey and gather with their loved ones. I am hosting the holiday this year. Do you have some holiday traditions you would like to share? This year is a special ones for my Jewish friends. Hannakuh and Thanskgiving are coinciding. One of my friends is calling it Thanksgivingkah. I guess it's okay to be snowing this early, but I am really looking forward to be traveling in sunny and warm places this time of year in the future. Have a great day. Write me at chantforhappiness@gmail.com and I will do my best to answer you. Send your victories, your questions, anything you wish. PowerPrayer for Believing In the Greatness of Your Life! My dear friend Morag in the UK wrote this PowerPrayer based on the guidance I posted a few days ago by Dr. Obo. Thank you Morag! Read this before chanting and infude your Daimoku with this power-full resolve! I believe in the greatness of my life! I want my life to shine and encourage others! I summon my faith and strengthen my practice. who support and inspire me now. I PRIASE MY LIFE! NMRK,NMRK,NMRK! Don't Get Discouraged! Don't Give Up on Your Goals! Some of us achieved total breakthrough by November 18th. Today I am helping my co District Leader move into her new apartment. She has achieved total victory! Some of us are still working on our goals. We chant Nam-myoho-renge-kyo, the name of the rhythm of life itself. If we persist, all of our prayers will be answered. If we give up...well...we give up. Please don't! Go to your friends in faith in the SGI, read President Ikeda's Guidance. The link to the SGI Portal is to the right. You owe it to yourself to stay inspired and not give up! How can we stay encouraged? We set deadlines to motivate OURSELVES into action. A deadline is not for the universe to respond to us. We chant. We take action. The deadline comes. We either win or we don't. If we don't get the result by the deadline we pick ourselves right up again and redetermine. The goal is to never be defeated. Sensei always says "To win in life is to never be defeated." That does not mean that we will never fail. The battle we fight is not with the universe. It's with our inner demons...the ones that say things like "obviously chanting doesn't work because I did not get my dream by my deadline...or...maybe I should have a different goal...maybe I wasn't MEANT to have that thing!....or what am I doing wrong? Maybe I wasn't chanting the RIGHT way!" It is at that juncture that we must recognize the opportunity to deepen our faith and our understanding of the profundity of Buddhism. ANYTHING that DRAINS OUR LIFE FORCE is the negative function. Any inner voice that causes us doubt and hopelessness IS the negative function. Once we decide we will win no matter what ~ we need only to continue. We've already won. The battle is with the negative function within. But decide from the onset that you will win no matter what. And hold YOURSELF accountable. Not the universe. If it is a crucial moment and you are in a dire predicament, financially, or health-wise, it is time to DEMAND the protection of the Shoten Zenjin. No prayer of a votary of the Lotus Sutra will go unanswered. If your prayer is going unanswered find out what it means to be a votary of the Lotus Sutra. STUDY. And as you are chanting DEMAND the result that you want through your prayer. Awaken to your mission and realize that all your suffering is your opportunity to encourage other people. That is what is meant by turning Karma into Mission." Thank you Kate! To me, being a Votary of the Lotus Sutra means that for every goal I set, I chant to be able to achieve that goal and show actual proof so that I can inspire others into achieveing their own happiness. My goal is to show actual proof in all I do. That is what being a votary means to me! Write me your victories and challenges at chantforhappiness.com. I'm so glad many of you liked yesterday's post. I know it was long, but it was so meaty! The following speech was posted on the Soka Gakkai Facebook Page. I printed it out and am reading and rereading it. It is a challenging essay, delivered to the doctor's division, and is opening my eyes. Do I really live as the Buddha? How can I live and breathe as the Buddha at every moment? How will realizing that great truth change my life, and the lives of those I touch? I just spent an hour chanting to be able to understand this long essay with my life, not with my head...to really, really experience my life as "The Great Buddha" at every moment. It is a long essay. I printed it out to fully absorb it. It is my gift to you, through the SGI on this day, the anniversary of the assassination of the great president, John F. Kennedy, a true, honorable statesman. medical field that took place at Atsugi Peace Center. A few years ago, around February, I went to give a seminar in Kashiwazaki where you can see Sado Island. This is also close to President Makiguchi’s birth home and Makiguchi Memorial Hall, It was Saturday. I saw my patients in the morning and took a bullet train in the afternoon in order to give a seminar in the evening. It was 10:30pm by the time the seminar was over. Since I was already there, I wanted to go see President Makiguchi’s birth house. I asked the YMD to take me there. There is only an empty lot as the house no longer exists. Approximately 100 feet away is Arahama shore. It was very windy. Even though it was snowing there was no snow accumulation. The reason I am speaking about Arahama is the mystical connection of the time and place of the birth of President Makiguchi. From Arahama Shore you can see Sado Island to your right. When Nichiren Daishonin was exiled to Sado, he traveled from Kamakura north to Teradomari and from Teradamori to Sado. Two and a half years later he traveled back from Sado south to Bangin Cape in Kashiwazaki. This route represents an alphabetical character U shape. thinking about it, I could see more. In Japan there are two different cultures: one is the culture of the village; and the other, the culture of the ocean. The mentality of the village culture is to go with the flow. This means that the people of the village culture are particularly concerned with what everyone else thinks about them. In essence, public opinion equals the village. agoraphobia. For people with agoraphobia meeting people who are familiar to them is most challenging to them. Instead, meeting strangers is less problematic. Thus, this is a disorder caused by the fear of the public immediately surrounding the individual. Strangers are not part of the public (village) therefore they are non-threatening. For many Japanese, the village-like mentality deeply lies in their consciousness. To be aware of peoples eyes means to be aware of the eyes of familiar people. In this culture, people are taught not to view things as black and white, not to take a position either way, not to be arrogant, or audacious, or meddlesome. This year, I have been thinking about this. I see many psychiatric patients, patients with asthma, patients with sinus infection, patients with eczema, and patients with severe allergy. I have seen more than 10,000 patients so far in my practice. What I found in common with all these patients was their conformity. I hardly see non-conforming people. Imagine that out of 10,000 people the vast majority of them are conformists! How interesting! I can't help thinking that conformists are more susceptible to having an illness. The word conformist, in Japanese, majime, has changed its meaning over the past decades. It used to mean Serious or sincere, but now it means to go with the flow of custom or culture. Above all, Japanese culture is troublesome. It is a culture that promotes sickness. Thus, modesty, the virtue of humbleness, being refined, males should say little, females should be one step behind, being considerate, being harmonious, suppressing yourself, not being audacious, not being over confident, and not being arrogant one word to kill yourself is Japanese culture. Therefore, the more conforming you are, the more devastated you will become. In general, conformists lack individuality and are passive. Leaders in society, such as presidents of companies, tend to be arrogant and aggressive and powerful. They also lack common sense and are authoritative in nature. In this society, from the standpoint of Japanese culture, I have observed that bad people have more energy. Good people are not energetic and sickly after all. From a Buddhist viewpoint, one who is shining the true self of the entity of Myoho (mystic law) is in a sense audacious. Audacious people live according to the Mystic Law. On the other hand, conformists who suppress themselves actually kill the entity of Myoho. This is a slander. The best example is the congressmen of the Japanese Democratic Party. After the elections they were interviewed and their attitude was only that of self-absorption. It makes you wonder why they get elected but these people are truly energetic, powerful and have a lot of fortune. On the other hand, conforming and serious people lack fortune. President Ikeda often says, Let's be audacious, bold and tough. Be confident and persuasive. After all, this is the correct way. The problem is not that bad people run the world but that good people are killing themselves. If serious people, kindhearted people, good people, and warmhearted people speak up and stand up for justice and create momentum, selfish people will automatically feel uncomfortable and eventually vanish. President Makiguchi once said, only if we create this can we have the era of humanistic competition. In fact, this Japanese culture of being conforming and serious is the culture of the village. If you act differently you will become an outcast of the village. The village people do not like those people who speak clearly of black and white. Another Japanese culture is called the culture of the ocean. Do you remember when the Japanese pitcher Nomo came to play for the Los Angeles Dodgers? At that time the major league was on strike. Many wondered what was going to happen to Nomo and questioned if he would make it in the major leagues. Many Japanese people and the mass media wrote bashing articles against Nomo. People asked him why are you going overseas. Yet, Nomo came to America without any hesitations. Before you knew it he was in the All-Star game as a rookie. Suddenly Japanese paparazzi were on his side and praising him. They wanted Nomo to say, “I will do my best for Japan.” However, he refused to say it. Instead he said, “I enjoy pitching.” We all thought Nomo must have been fluent in English but he could hardly speak English. In an interview after winning the game, Nomo had a translator with him. I was wondering if he was scared. By just looking at Nomo I felt that he doesn’t have a typical Japanese attitude. Later I found that he was born in Osaka but his parents were originally from an island off the coast of Japan. During the Muromachi period these islands were where pirates lived. These people started Japanese villages in Southeast Asia. These islands are still islands of many fishermen. Nomo’s parents had the culture of the ocean people. The ocean culture is very independent, energetic, and open. On the other hand, village culture is very concerned with the opinion of the public, it is conservative and has a pattern of having two different sides: smiling on the surface but disagreeing inside. As I mentioned before there a two types of culture within Japanese society. It's fun to talk about these cultures when I travel from place to place. On the ocean side of Japan there is a strong tendency for ocean culture and on the mountain side there is the village culture. If you visit a region which share both of these cultures the leaders of the Soka Gakkai ask why is it so different even in the same organization? After I explained the village and ocean culture they could understand the differences. Many Japanese religions and philosophies are based on the village culture. Do you know the only religion based on the ocean culture? Yes, it’s the Daishonin’s Buddhism! Nichiren Daishonin called himself the son of the sendala, in other words the son of a fisherman. It is the ocean culture. In a time of strict class systems, the Daishonin called himself the son of the sendala, and the sendala means “chandala” in Sanskrit. It is the lowest of the caste system. It means the son of an untouchable, and he was proud of that. It was the time that you could do anything you wanted if you were born in a higher caste. The Daishonin placed himself within the lowest class of his time. The Daishonin fought against the highest authority of the nation. The Daishonin fought the authority head-on without any support. I think that showed a great contrast between the Daishonin who had no class or authority and the other with all the power. As they clashed the Daishonin called authorities “The ruler of this little island country.” For people of the village culture this was inconceivable. Only the Daishonin, who truly was a man of the ocean culture, was capable of making such a bold statement. The Daishonin’s Buddhism is a philosophy of the ocean culture. That’s why it’s very independent, open, progressive and energetic. Nevertheless, the Daishonin’s Buddhism eventually became influenced heavily by the village culture after his death. The Daishonin’s Buddhism became corrupted. As a result the high priest became absolute. Eventually lay followers were considered too unworthy to see the high priest. Another characteristic of the village culture was the class system. Old time villages consisted of landlords and tenants. Tenants had to crawl in the presence of landlords. Seven hundred years passed and President Makiguchi was born as a son of a fisherman in Arahama. He was raised in the ocean culture, so despite the time period, he did not have a village mentality. President Toda was raised in Atsuta and born in Ishikawa prefecture. He also was the son of a fisherman. One of his ancestors was captain of a fishing boat. He truly was a man of the ocean. President Ikeda was a son of a seaweed maker. When looking at this, the Soka Gakkai entirely consists of the ocean culture. It is directly connected to the Daishonin except some areas that became village-like in the last 700 years. Interestingly, my senior, Professor Miyata at Soka University, is doing a research on President Makiguchi. He suggested that if he ever directly encountered the priests from the Head Temple he wouldn’t have joined the Nichiren Shoshu sect. President Makiguchi was in search of a religion that could be the basis of his Soka educational system. In one word, Soka education means to open up a person’s possibilities, to view every student with a warm heart to help the student be independent and logical. He was searching for a religion that would lay a foundation for his educational system. Then he encountered Nichiren Shoshu. Priest Horigome had founded a temporary branch office in Nakano. Priest Horigome was studying a philosophy at Waseda University. He concluded that Buddhism can no longer contribute to society as long as it remained in the temple. He thought they needed to start a religious movement in which lay believers could play an active role. That’s why he founded that temporary branch. When Priest Horigome, who believed in the Buddhist movement of lay believers, and President Makiguchi, who believed in the Soka educational system met , a religious movement based on humanism started. Ironically, there was no such tradition within Nichiren Shoshu. Because of that, from the very beginning the priesthood thought that the Soka Gakkai was arrogant, and they also claimed that the lay believers shouldn’t be audacious. This is a good example of the confrontation between village culture and ocean culture. In the past there was the Tanuki festival incident and many other incidents that involved the priesthood and they all originated from the difference between those two cultures, village and ocean. I think that these differences became more evident in situations such as the current priesthood issues and the Soka Gakkai. Therefore, this situation could not have been avoided. This is a prelude to what I really wanted to discuss. Let’s go back to the prime point and look at ourselves. How many points could you give yourself out of 100 when looking at yourselves right now? Please raise your hand if you think you fall within the range of 0 to 60 points. Thank you very much. Now raise your hand if you think you fall between 61 to 99 points. Usually only a few people raise their hands here. Most people raised their hands with points 0 to 60. Oh, the doctors division is different because most of you raised your hands within the higher group. How about 100 points? Oh, two people raised their hands. Thank you very much. Except these two, the rest of you are not practicing Nichiren Daishonin’s Buddhism. Nichiren Daishonin’s Buddhism is the religion that teaches us that we are 100 points. As noted previously, the Daishonin’s Buddhism emphasizes living audaciously, boldly, and tough. It is hard to understand this. In Chinese characters shinjin (faith) means “Believe from the heart.” Then what is it you are going to believe in? It is the Gohonzon and also the Lotus Sutra. What does it mean to believe in the Lotus Sutra? Nam-myoho-renge-kyo Buddha at 60 points? Well, it’s hard to understand, I’d like to make a comparison. I have written an article titled, “A Strange Principle” for the health section of the Seikyo Shimbun. In observation of many people, conformists, hard working, responsible, caring and altruistic people, mysteriously enough come to a deadlock. Those conforming to others while working hard cannot break through. These altruistic people often face rejection, refusal, being made fun of, and in extreme cases are despised. Have you seen these people? Serious conformists can’t advance. On the contrary, irresponsible, arrogant, and shrewd people are successful in every attempt. Since everything goes well and they are targeted for flattery they become even more successful. This is a very popular phenomenon. While I have encountered various types of people and their lives, I have witnessed many of these cases. What is this all about? Earnest people are fooled and the villains get fattened up. I have pondered Why?-for a long time but I didn’t get an answer. I had an opportunity to research while still contemplating this issue. I began to see the mechanism of the strange principle little by little. Hesitantly, I wrote about it in the Seikyo Shimbun. I was afraid that it would be too controversial or that it would be cut, but I had to write it anyway because I thought there must have been some people bothered by the same thoughts. Luckily, the article made it to the final print, and some have responded. The principle means that, even if they are fighting for others in need, their families, SGI activities, Kosen-rufu, world peace and injustices in the world, those who kill themselves and who neglect themselves will eventually lose fortune. Therefore, this is a principle that as long as you neglect your own life, then others will neglect you. People say, as long as I persevere and endure someday my hardship will eventually pay off. Until then I must be patient. “Where there is unseen virtue, there will be visible reward” (WND page 907) The harder you endure the worse off you become. One after another you go through even more hardships. Thus you are not making any “unseen virtue”. Why? Because you are killing your life which is the entity of the Mystic Law. You accumulate fortune when you rejoice and enjoy whatever you do and when you allow your life to shine as it is. It will become your good fortune. Automatically, others will value your existence. For instance, some say “You can overcome your problems if you do shakubuku, if you promote Seikyo Shimbun you can be happy; you can be happy if you try to do more zaimu.” This is a life condition of hunger. You are always expecting something in return so if you don’t overcome your problem you would resent it. It is different from the life condition of Bodhisattva. The Daishonin states, “Self and others rejoice together.”; That’s why there is a famous allegory of Tokusho Doji. He wanted to donate something to the Buddha because of watching others make their contributions. Since he didn’t have anything to give he made a mud pie. If he thought he could get something in return by giving the mud pie, such as getting a benefit later or being reborn as King Ashoka, if he did it as if he were trading using the mud pie, he would not have gained any benefit. It surely is true. This is the “Strange Principle.” Strange means Myo and principle is Ho. Thus, people who neglect the entity of the Mystic Law lose fortune. People who shine their entity of the Mystic Law multiply fortune. The question is which way you are. Simply, it is either way. It is whether you shine in your life, and the direction in which you enjoy living, or a direction in which you disrespect yourself. The most important thing is which way the basis of your life is facing. I would like to ask again, who would give themselves 100 points in this audience? There are a lot of honest people. Sorry for side tracking and making little sense. We do Gongyo every morning and evening. Do you remember the second silent prayer? 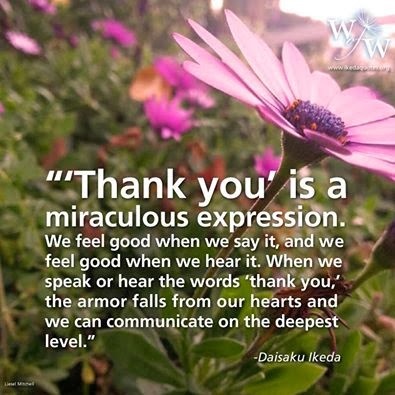 Yes, it is appreciation for the Gohonzon, I offer my deepest praise and most sincere gratitude to the Dai-Gohonzon of the Three Great Secret Laws, which was bestowed upon the entire world. Accordingly, it’s not the Lotus Sutra. In another Gosho passage, never seek this Gohonzon outside yourself. The Gohonzon exists only within the mortal flesh of us ordinary people who embrace the Lotus Sutra and chant Nam-myoho-renge-kyo. (WND page 832) Within your heart, within your life itself, “The Gohonzon exists only within the mortal flesh of us ordinary people.” We have studied this. Do you remember studying that? When we chant to the Gohonzon we actually put it outside ourselves. That’s strange. What we learn and what we do are completely different. Why is this so? In fact we are all poisoned by the village culture previously mentioned and also by the Japanese culture. The village culture equals the Nembutsu culture. In the Nembutsu culture the Gohonzon is absolute and the Daishonin is absolute. While having no fortune, having a low life condition, and having no strength some of us need to appeal to the Gohonzon for mercy and for the Gohonzon to share benefit and wisdom with us. That is the Nembutsu culture. If you switch the Gohonzon with Amida Buddha, it makes sense. The mechanism is that we are so miserable let’s ask the Amida Buddha for its mercy. The Lotus Sutra is different. President Ikeda over the period of four and a half years has taught us the Wisdom of the Lotus Sutra. In the Wisdom of the Lotus Sutra he mentioned it most directly. The word Ken means to view, hotou means the Treasure Tower. This means to view the Treasure Tower. This Treasure Tower appears in the Lotus Sutra. The height of the Treasure Tower is a 500-yojun. If calculated, it would be more that 500 times the height of the Himalayas. Mount Fuji is pretty high but the Himalayas are twice the size of Mount Fuji. The Treasure Tower is more than 500 times that size. Well, that’s magnificent. Nevertheless, it’s not a mountain of scraps but it’s a tower oftreasures. It is very majestic, splendid, and universal. This grand Treasure Tower actually Symbolises the greatness of our lives. In other words, to realise that our life and existence is universal, splendid, magnificent, and eternal is called Kenhotou. The Daishonin inscribed the Gohonzon using the ceremony of the Treasure Tower. Thus, the Daishonin clearly explained that the Gohonzon is the clear mirror used to view our bodies as the greatest Treasure Tower. The Lotus Sutra is a sutra that teaches us that even when our life condition is the worst, “I’m still great.” Did you know that? There is a difference between the Lotus Sutra and provisional teachings. It is called the Five - Fold comparison. The reason why the Lotus Sutra is superior to the provisional teachings is because theoretically, the Lotus Sutra preaches the attainment of enlightenment for the people of the two vehicles, evil people, and women. At that time, the public neglected those people. Therefore, the provisional teachings did not help them. On the contrary, the Lotus Sutra taught that those people, who were discriminated against and neglected by the public, were truly great. This philosophy was revolutionary. It was truly humanistic. From the standpoint of life philosophy, people of the two vehicles, evil people, and women are in fact the life condition of yourselves when you are down. It is the most miserable self. In comparison with others you can’t help thinking that you are inferior, and within yourself, in such miserable circumstances, you need to believe that you are the entity of the Mystic Law; that is the true meaning of embracing the Lotus Sutra. It is why it is difficult to believe and difficult to understand. (nanshin nange). It is not difficult to see yourself as great if you are healthy, in rhythm, and admired. Yet it is difficult to believe, and understand yourself as great when you face the biggest failure, face being ridiculed, and face depression. Believing yourself as great is the true meaning of embracing the Lotus Sutra. We are called “Compassionate Doctors Division.” I was unable to understand the meaning of compassion (jihi). Although the Doctors Division was often called compassionate, the more I pondered, the less I comprehended. In Japanese ji means benevolence, which I understood, yet I could not understand the word hi which means sad. Some say jihi means to share suffering with others, another is to eliminate pain and give joy. Yet I still didn’t understand. 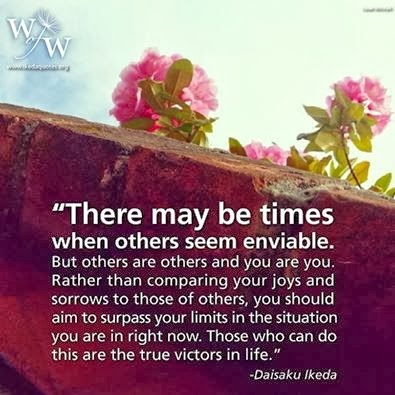 At that time I read a passage in President Ikeda’s essay, “When your soul is victorious, your sadness becomes hi of the word jihi.” When I read that I had a revelation. I was reading jihi as a meaning to be benevolent and sad, which made me more confused. If read by the Chinese character, it reads to be benevolent in times of sadness. Thus, it means to embrace yourself with a warm heart ­ when you are at your lowest point, when you are in the midst of the worst suffering, or in the depths of your anxiety. Here lies the aspect of a victorious life. For those who are able to embrace themselves in the midst of suffering, their sadness is no longer sadness. Such sadness itself will be transformed into courage when embraced by one’s own compassionate heart. Despair will evolve into hope. The true meaning of an indestructible life lies only this way. Only those who embrace themselves can truly cherish others who are suffering as if it were their own. For example, when you are low you don’t like yourself. Later when you are feeling better and seeing others in the same situation you may say, “That a pity!” Yet, deep within yourself you judge them by thinking. “How weak, he is a failure after all” The way you judge yourself is exactly how you judge others. Only when embracing and respecting your lowest self with a compassionate heart like “I love me” or “I’m truly great” can you respect other people. This is the guidance of twenty or thirty years ago. This is Nichiren Daishonin’s Buddhism. So now, who is going to give 100 points to yourself? (laughter) Thank you very much. There are so many obedient people. There are still a few people who could not raise their hand. I want to make one more point. In the Gosho, “The Heritage of the Ultimate Law of Life” (WND page 216), it quotes Shakyamuni Buddha who attained enlightenment countless kalpas ago, the Lotus Sutra that leads all people to Buddhahood, and we ordinary human beings are in no way different or separate from one another. To chant Myoho-renge-kyo with this realisation is to inherit the ultimate law of life and death. This is a matter of the utmost importance for Nichiren’s disciples and lay supporters, and this is what it means to embrace the Lotus Sutra. This is the foundation of the Daishonin’s Buddhism. This is what it means to embrace the Lotus Sutra. This is the most important sentence of the Gosho. In this Gosho, “Shakyamuni Buddha who attained enlightenment countless kalpas ago” is Nichiren Daishonin. “The Lotus Sutra that leads all people to Buddhahood” is the Gohonzon. “We ordinary human beings” means oneself. Nichiren Daishonin, the Gohonzon, and oneself are in no way different or separate from one another. 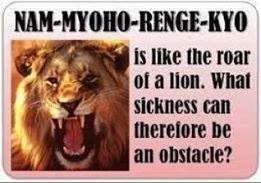 To chant Myoho-renge-kyo with this realisation is to inherit the ultimate law of life and death. Because of that, when we grade ourselves with 60 points we are grading Gohonzon 60 points and Nichiren Daishonin 60 points. Aren’t we? They are “In no way different or separate from one another.” Don’t we call this “Slander”? The person who said I grade the Gohonzon and the Daishonin 100 points but I grade myself 60 points doesn’t believe “No way different or separate from one another. We call this “disbelief”. People who do not grade themselves with 100 points, we call Slanderers and disbelievers. In the same Gosho (page 217), it says, “Those who disbelieve and slander the Lotus Sutra will immediately destroy all the seeds for becoming a Buddha in this world. Because they cut themselves off from the potential to attain enlightenment, they do not share the heritage of the ultimate law of life and death.” Those who disbelieve and slander the Lotus Sutra, those who cannot believe oneself 100 points “Will immediately destroy all the seeds for becoming a Buddha in this world.” Concerning one who disbelieves the Lotus Sutra, because the sutra states, “When his life comes to an end he will enter the Avichi hell, the wardens of hell will surely come for one and take one away by the hand.” At the end of one’s life the warden will come and take your hand. Those who grade themselves a Buddha of 100 points, those who believe and enjoy it, live with the life condition of great security and are received and supported by a thousand Buddhas when they come to the end of their life. “How can we possibly hold back our tears.” Which one would you like? The warden of hell or a thousand Buddhas? If you can not raise your hand here, you will never be able to raise your hand. I will ask you once again. I am not threatening you. This is what the Daishonin says. This is the last time I will ask you. Do you grade yourself 100 points? (Big laughter) Thank you very much. After this meeting, when you’re going home, please think, “The great Buddha is walking.” ”Great Buddha is looking at a mirror, reflecting a life and praising this life.” This is the true meaning of doing Gongyo and Daimoku. The reason people feel more secure when they compare themselves with others is because they have anxiety in the depths of their lives. They have disbelief and inferiority thus they become anxious after short periods of relief. Later on, they catch others and need to be reassured that, “I’m more impressive, I’m greater!” These kinds of people, who continue to show off, are called arrogant. Deep within their arrogant heart they have inferiority and self-doubt. The best example is Nikken. He is a mass of inferiority. He can’t even say “Thank you for your hard work” to President Ikeda after being informed of President Ikeda’s contribution to the world. Why? Because Nikken feels inferior, he needs to be reminded that he is greater. Such a person cannot say words of appreciation. On the other hand, the world’s greatest people, as an old Japanese proverb says “The riper the rice grain, the lower it hangs,” the greater the person the more humble he is. They respect other people because they have confidence and pride in themselves. Such confidence and pride does not come from the recognition of others. The world’s greatest people did not become the best because of recognition. The public recognises these people because they are the forerunners of the fields in which others paid no attention. Fundamentally the greatest way of living is to have confidence and pride in oneself. At a glance, to view yourself as I am a great Buddha, I rate myself a perfect 100 points seems arrogant. Actually, it equals the greatest way of living. Since it is similar to having an arrogant attitude, it is called “The arrogance of the Lotus Sutra.” The arrogance of the Lotus Sutra is the correct way because its meaning is fundamentally different from arrogance in attitude. President Ikeda repeatedly says, “You are Buddhas, Don’t be deceived. Please believe that you are all Buddhas.” I bet we don’t really believe what our mentor says, do we? 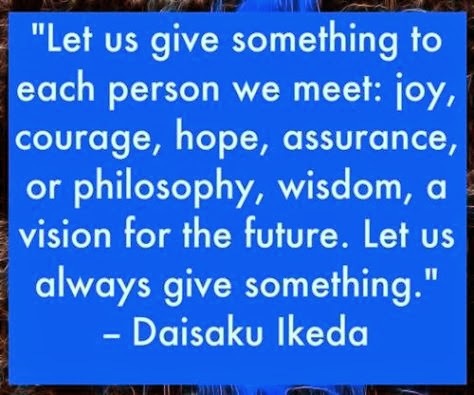 We think President Ikeda is just saying that to encourage us. We think he is saying “You are Buddhas” to encourage us, but the truth is different. We take our mentor’s words as encouragement, but we don’t really believe it. Such an attitude is arrogant. It’s okay that we seem like we are arrogant, or audacious or bold although people might not like it. Yet, if we change our attitude this way, everything strangely starts to open up. I often realize that when I see such cases and people. Conformists are now deadlocked. The fundamental cause is Nembutsu mentality or “Village culture” The world will not take Japan seriously if Japanese people remain in the village culture. Finally, the time has come to spread the philosophy of the Lotus Sutra that possesses the independence of the ocean culture to the world. In a sense, the time has come for the Soka Gakkai to take the lead. It’s not a good idea that the Soka Gakkai remains like the village culture. When you go to bed, think “ ..great Buddha is going to sleep now” In the morning, as you wake up, no matter how you feel, think “ great Buddha is waking up” When you change clothes, when going to the bathroom, when washing your face, and making miso soup, think “This miso soup is made by a great Buddha. This is a great bowl of miso soup.” Live your life by praising your own life, enjoy whatever you do, and taste every bit of it. Each morning wake up with the Buddha, and each evening go to sleep with the Buddha. (Record of the Orally Transmitted Teachings) Live life with joy every moment ­ this is the true meaning of the practice of reading the Lotus Sutra with your life. We chant three times at the end of this meeting. Let’s chant three times while remembering that This chanting praises our lives.